What happens when a no-account anti-gun group gets ignored by people who actually have some effect on legislation/litigation? "ISRA IS financially linked to gun makers." Heh. This is one of those cases where they will dodge and weave to change the subject when they're asked to prove this. Why? Because they're liars. When the facts don't fit their worldview, they make them up. As one of their supporters put it "And my opinions to me is a fact". That's what they called the ISRA's ED Richard Pearson for not giving them the time of day on their radio program. Now the ISRA has about as many actual, dues paying members as the NGAC has 'likes' that they bought through their FB page. They then posted a link on the ISRA's FB page to try and get some attention, desperately needed by what is effectively a non-entity filled w/ C and D list anti-gunnner names. So I challenge the real cowards at the NGAC. Unban all the countless pro-rights activists who have not made any threats against you so we can discuss things. That's what you want, right? Hey, did you know that a contract running out on a pro-gun billboard and it coming down is in reality the result of the 'mommies'? Slide Fire sent me the contracts with Lamar Advertising. The first document, signed in October, was to put up the 14-by-18-foot billboard for four weeks. A second contract extended the $3,500 space in Chicago for four more weeks, until March 9. That is why the mothers group is seeing the blank space. But they'll repeat this 'win' over and over no matter how many times they're fact-checked because at their core, they know they don't have any other option but to lie. Unsurprisingly, Chicago loaded their ballots w/ 'advisory' referendums that hold no legal weight but can be used as propaganda points as the various politico's push their agenda. Also unsurprisingly, the 'referendums' used as much loaded terminology as they could to get the desired results. "Should Illinois amend the Firearm Concealed CarryAct to ban the possession of a concealed firearm in any establishment licensed to serve alcohol?" 'Guns in Pubs'? You mean bars that receive the majority of their business (iow 50%+) from the sales of alcohol? Already illegal as per the FCCA. What they want to do is ban them in ANY establishment that serves ANY alcohol whatsoever. IOW pretty much every restaurant. Of course, w/ that wording, the referendum passed 73-27. "Should the State of Illinois pass legislation banning high capacity magazines with more than 15 rounds?" 'Large Gun Clips'. 'High Capacity magazines'. No meme's there at all, no-siree. Again. 76-24. Hell, they could have put Durbin's one round limit there w/ the same wording and gotten the same results. This is the reason the pro-rights side pushed so hard to determine at least handgun laws could only go through the state legislature and not the anti-gun fanatics running the City of Chicago and C(r)ook Cnty. The ONLY thing these 'advisory referendums are going to be used for is to add to the 'ban guns' drum beat we hear every year from their ilk. "Oh look at this, all these people want to ban X. See, we have support". But when it comes down to doing anything real, like even joining an anti-gun group, these 'votes' (multiple times by my dead grandma) are nothing more than farts in the wind. Should the billboard company bow to pressure and remove the guns, apple pie and baseball message? No, it's a First Amendment issue and should remain. Yes, the message is offensive to neighborhoods where gun violence is rampant and that trumps the First Amendment. Now when I first saw it, it was 81% No to 19% Yes. Shortly after, it was linked to by a few pro-rights group and the percentages changed. Within a few hours, it went to 86% No to 14% yes w/ a hair under 4K votes. Now to me, this shows two things. As much as Mom's Demand Lovin' claim they have the public's pulse, the only time polls go in their favor are when they're done inhouse. Reality and 'polls' show support for pro-rights groups running 5 or 10 to 1 in favor. The other is the percentage of people that believe their personal biases/feelings trump Constitutional rights, unless of course it's THEIR rights being infringed upon. Think about that. All those people that think Freedom of Speech, the Press, Warrants, what have you are dependent upon feelings. Whether you like guns or not (and I'm thinking most of my readers do), that so many people believe that concept should frighten the crap out of you. The 'Reverend' Fred Phelps of the Westboro Hate Cult is in a 'care facility'. I hope he's writhing in agony before a long, painful death. Anti-gun fanatics hate anything to do w/ guns, even pictures of them. 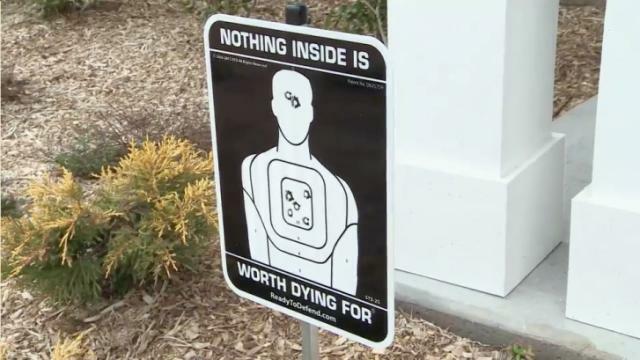 A few weeks ago, there was some discussion over the conniptions they were having over, get this, no guns allowed signs because they pictured... a gun. Because apparently they consider the general public to have an IQ somewhat lower than your average house plant. “I think the general public will be alarmed by it and wonder if people have been allowed to bring guns to school in the past,” she added. The principal also suggested that a more “subtle” image be used, rather than a gun. Perhaps a “logo,” she said. 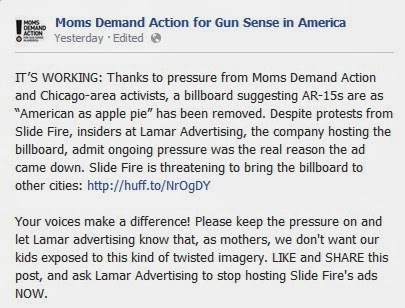 Around the same time, the Bloomberg puppet group 'Mom's Demand Lovin'' and their half dozen IL 'members' got their knickers in a twist over an advertising sign equating firearms w/ American values. There's a poll asking if you hate the first amendment as much as they do. Poor babies. Even the idea of a firearm 'offends' them. These are the same kinds of people that, when they were in college, would destroy literature from groups they didn't like and then wonder why they faced opposition for their 'progressive' ideals.